The Government of St Vincent and the Grenadines has evidently taken responsibility for our nation’s health, as part of the global community, by becoming a signatory to many regional and international declarations that promote and preserve health and environmental sustainability. Thus, the Government has adopted the policy of “health for all in the 21st century”. This policy is articulated in several government policy documents such as the 2010-15 National Development Plan, the Interim Poverty Reduction Strategy Paper and the Medium Term Economic Strategy Paper. The Ministry of Health, Wellness and the Environment has streamlined this policy in its draft National Strategic Plan 2007-12 which has as its goal to improve the health status of the population. The Ministry of Health, Wellness and the Environment has executed its mandate of universal healthcare provision to reflect principles of equity, accessibility, affordability, quality and cultural expectation. The Ministry’s mission is carried out through 16 programmes, each with a different mandate/focus, but all with the ultimate goal of improving the population’s health. iii. articulating policies to promote universal coverage, equity and sustainability of the health system and iv. strengthening the steering role of the Ministry of Health, Wellness and the Environment. The Government of St Vincent and the Grenadines has been one of the regional recipients of the World Bank project designed to address the prevention and control of HIV/AIDS during the period 2005-10. To date, as a result of the disease shift from communicable diseases to chronic noncommunicable diseases, the recently implemented 10th European Development Fund Project, which has been crafted to modernise the health sector, has incorporated a critical component in order to address “Wellness & Chronic Diseases” in St Vincent and the Grenadines. One of the many challenges being faced as we move forward as a nation is the sustainability and integration of programmes and services within the health sector. To this end, the Government of St Vincent and the Grenadines will benefit from any Commonwealth initiative and collaborative efforts which will contribute to further the development of healthcare in our nation. 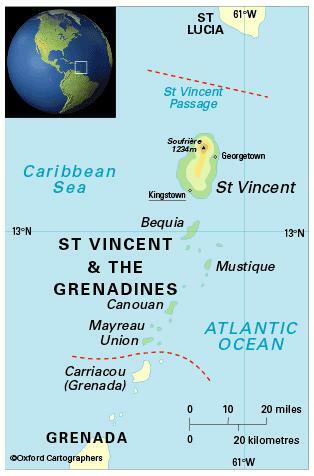 St Vincent and the Grenadines, one of the Windward Island countries of the Eastern Caribbean, lies near the southern end of the Caribbean chain, about 97 km north of Grenada. The country comprises six parishes, one of which is the Grenadines. Tropical, moderated by trade winds in June/July. The dry season is January to May, the rainy season May/June to September. There is significantly heavier rainfall in the mountainous interior. Tropical storms and hurricanes may occur June-November. The most significant environmental issue is pollution of coasts and coastal waters by discharges from yachts and from industrial plants on shore. 109,000 (2012); 50 per cent of people live in urban areas. The population growth rate stood at 0.1 per cent p.a. between the years of 1990 and 2011, depressed over this period by emigration. In 2012 the birth rate was 17 per 1,000 people (40 in 1970) and life expectancy was 72 years (63 in 1970). The population is mostly of African or mixed descent, with Indian, European and Carib minorities. St Vincent and the Grenadines is classified as an upper middle income economy by the World Bank.